Utrecht University is a leading modern comprehensive research university with a growing international reputation. On the 2016 Shanghai Academic Ranking of World Universities, Utrecht University ranks first in the Netherlands, 22th in Europe and 47th in the world. The University has state-of-the art research facilities and excellent research training through graduate schools. At the faculty of Veterinary Medicine, The Department of Biochemistry and Cell Biology, houses the ‘Intercellular Communication’ group led by Prof. Dr. Marca Wauben. The ‘Intercellular Communication’ group within the Department of Biochemistry & Cell Biology is internationally recognized as a leading research group in the EV field. The lab has longstanding experience in developing EV isolation procedures (with ample expertise on density gradients, size exclusion chromatography and immune affinity separation). Additionally, comprehensive molecular characterization (Western blotting, lipidomics, genomics and proteomics), quantification and single EV-analysis (high resolution flow cytometry) and functional EV analysis, especially on immune modulatory effects on T cell activation (using human CD4 T cells) and TLR signalling (using HEK-Blue TM- human TLR reporter lines) are routinely performed. In order to study milk EVs, the Wauben lab has established several biobanks containing human, bovine and porcine milk samples. Recent work on milk EVs unveiled novel immune modulatory EV-associated proteins, lipids and RNA molecules. Current studies focus on the capacity of milk EVs to influence the function of various cell types. The team is responsible of the EV separation from bovine milk and providing raw material for development of a integrated modular system for EV isolation. Nanosized milk EVs will be isolated from fresh bovine milk by adapting protocols based on differential ultracentrifugation followed by density gradient floatation or size-exclusion chromatography separation. 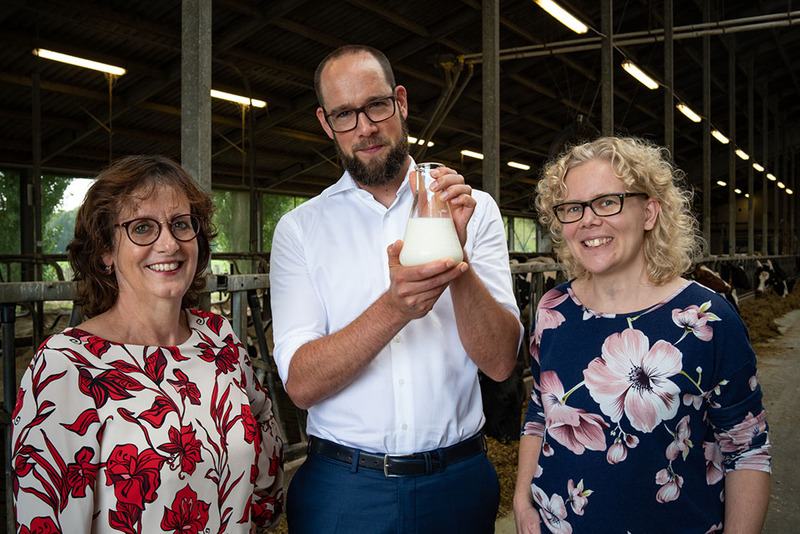 This ‘gold standard’ of isolated milk EVs wil be sent to the other participating groups that can further characterize the chemical properties of the EVs. Additionally, the provided samples can be used by the partners responsible for the development of the modular systems. Obtained purified EVs will be evaluated by the team for their immune modulatory properties in vitro by using T-cell activation and TLR-triggering assays. van Herwijnen MJ, Driedonks TA, Snoek BL, Kroon AM, Kleinjan M, Jorritsma R, Pieterse CM, Nolte-’t Hoen EN, Wauben MH. Abundantly Present miRNAs in Milk-Derived Extracellular Vesicles Are Conserved Between Mammals. Front Nutr. (2018) 18;5:81. doi: 10.3389/fnut.2018.00081. eCollection 2018. Van der Vlist EJ, Nolte-’t Hoen EN, Stoorvogel W, Arkesteijn GJ,Wauben MH. Fluorescent labeling of nano-sized vesicles released by cells and subsequent quantitative and qualitative analysis by high-resolution flow cytometry. Nat Protoc (2012);7:1311–1326. Nolte-'t Hoen EN1, Buschow SI, Anderton SM, Stoorvogel W, Wauben MH. Activated T cells recruit exosomes secreted by dendritic cells via LFA-1. Blood. (2009) 26;113(9):1977-81. doi: 10.1182/blood-2008-08-174094. Epub 2008 Dec 8.